October 2011: The following really must be read tongue-in-cheek, I'm afraid. 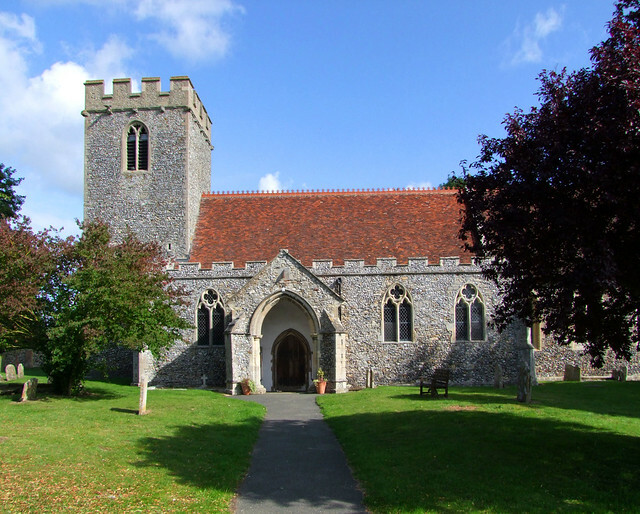 When I wrote the two parts originally, back in 2002, All Saints was one of the last Suffolk churches I visited, and I am afraid that the style of this account of my two visits is somewhat demob-happy. I have been back to Barrow since; however, in keeping with the blog-like nature of this site, which of course was begun before the word 'blog' had ever been thought of, I have kept the original entry as it was - with a small postscript, just to reassure you. It was late summer, 2002: I had never been to Barrow before. I had not expected it to be so big. It seemed a very pleasant place, a proper village, with a mix of old and new housing. It had a couple of shops, a decent pub, one of those funny little Baptist chapels, a village green, several ponds right beside the busy road - I have not seen so many squashed ducks before, which was mildly diverting. But no church, apparently. I didn't have my OS map with me, so I asked a man who was tending his garden by the crossroads. "Well now", he said, standing upright slowly and scratching his head, "there's a church over Denham way, about a mile up the road over there. Or there's the chapel, if that's the one you want." I thanked him, and picked my way through the squashed ducks, thinking it curious that someone in a Suffolk village should not know where their village church was. Perhaps he was a Londoner, working on his holiday home. A sign outside the Baptist chapel said Strict Communion, which brought to mind a Minister in leather holding a whip. Just beyond it, a group of boys were fishing for tiddlers in the pond, so I asked them where All Saints was. Unfortunately, this resulted in an argument; one said that it was further up the high street, another claimed vigorously that there were no churches around here, and I left hurriedly, before one of them pushed the other in the water. It took the nice Asian lady in the village shop to put me right, and she sold me a fine pie into the bargain. I followed her directions up the road towards Cavenham, passing the Hall, and, a great curiosity, half a Volkswagen sitting on the verge. It was the front half. I mused on it for a moment, wondering if this was St Edmundsbury Borough Council's idea of public installation art, or if someone was working on it, or if there had been a particularly nasty but very clean accident. I could now see the church tower in the distance, and hurried on, only to find about a hundred yards further down the road another half of a Volkswagen. And, get this, it was another front half. Not sure if this strengthened the case for installation art or accidents, it was with some relief that I reached All Saints, at a very tight bend in the road (ah, that explains the Volkswagens!). The graveyard here is huge, and pretty well full of three centuries of gravestones. It must be a fascinating place to potter about. I did a quick circumnavigation of the church, which has obviously been given a thorough going over by the Victorians. It was hard to tell what was medieval and what was renewed, although it is all done well, and looking fine. The door was locked. To be honest, I hadn't expected this; I had spent the day meandering around the area between Bury and Newmarket, and this was the first locked church I'd found all day. There was a sign giving keyholders' details, but it was pretty useless, being of the Thatched Cottage, Barrow, variety. It gave telephone numbers, but it didn't give the area code. I come across this again and again in porches - anyone phoning a keyholder from a church is, by definition, going to be using a mobile phone. You can't call a number from a mobile phone without an area code, but these notices rarely, if ever, give the code. I had no idea what the area code for Barrow was, and none of the other notices in the porch seemed prepared to reveal it. Miserably, I wandered around to the north side, and found a modern building that might just have been the Rectory. There wasn't a sign saying so, but it had all the hallmarks of clerical occupancy - two small cars, an untidy front garden, jam jars in the porch, a view of bookshelves and a computer through the window. A television was playing, very loudly. I pressed on the doorbell, and waited. And waited. I pressed again, but nobody came. I wandered slowly back to the road, still expecting the door to open, and someone in a dog-collar to greet me. But they didn't. I stood on the verge, wondering what to do next. An old lady cycled along the road towards me. She had two baskets, front and back. Small, noisy dogs sat in both. She smiled at me, a big beaming smile - 'Hello dear! ', she called. As she passed me, and headed on up the road towards Cavenham, she waved, and I swear she took both hands off of the handlebars. She must have been about seventy. I had a sudden panic that I had somehow stumbled on to the set of an episode of The League of Gentlemen. I got on my bike, and headed in the opposite direction as fast as I could, until Barrow was several miles behind me. Obviously, I'm never going back. I went back to Barrow in the early summer of 2003. I went to the aid of a distressed clergyman. His name was Father Peter MacLeod-Miller. He had been horrified to discover that I thought there was something rotten in the state of Barrow. I must come again, and I must come now. Well, trivialities conspired against me shooting straight over (a full-time job, a family, the lassitude that accompanies mid-life crisis, general fear of the unknown, etc) but within a few weeks I rolled up outside All Saints again. It was 9am on a Saturday morning, but already energetic parishioners were out and about giving the graveyard its first cut of the year after the late Spring flowers had seeded. My eyes were on the glory of the church door - it was open. As we walked up to it, we were approached quickly in turn by Father Peter MacLeod-Miller himself. I flinched, but he didn't punch me. Instead, he shook our hands energetically, and turned out to be really, really pleasant. This was a plus point for Barrow - a jolly minister. Some are, and some aren't; you tend to remember the ones who aren't. But Father Peter MacLeod-Miller is something else you don't find every day in a Church of England minister - he is energetic. And even rarer than that, he's Australian. This struck me as a very affable combination. He led us into the church, and proudly showed us around. I can tell you that Barrow church is very nice inside. It is obviously much loved, and well-cared for. I expect you think I'm going to say that it is completely normal, not odd at all, not the least bit Royston Veasyish. Well, you are wrong. There are several ways in which it is most unusual. Firstly, there's the smell. Not damp, not wood polish, not even flowers, but the smell of incense. Incense is simply not something you find in rural Anglican churches in Suffolk. Outside of the four big towns, there is probably only Mendlesham where you encounter it. Mind you, they use enough at Mendlesham to make up for the rest. No; in my experience, rural Suffolk protestants are allergic to incense. If you want to empty your church pretty swiftly, use it. Father Peter MacLeod-Miller has started burning it here, and at Risby and Great Saxham. And here's the thing - the congregations are actually growing. There is obviously something unusual and special going on here. And I think I know what it is. I'll tell you in a moment. Another thing odd about Barrow is that there are still people in the parish important enough to have seats reserved for them. I loved that. There's Lady this, and Sir that, but there's also a health food millionaire who hands out samples of Emu oil after services. Anything else odd? There's a most unusual tryptich on the altar in the south aisle. It shows St Michael contending with a dragon. The style is - how can I put this? - a prog-rock album from the mid-1970s. I was surprised to learn that it is rather more recent than this. I suppose you want to know what else is in the church. Well, there's the font with its painted shields ; you can see something similar a few miles away at Horringer. Here, the shields show both ecclesiastical and secular powers, ranging from the Diocese of Ely to the State of France. It was repainted in the 1960s, according to Mortlock. The odd one out is to the local Despencer family. In a lancet in the north wall are two curious shapes of medieval painted figures. Obviously, they were exposed by the Victorians, and the white plaster had been regularly renewed up to their outline. Unfortunately, the exposed figures have now faded completely; only their ghosts in the plaster show us where they once were. Up in the chancel, there is a lively painted memorial to Clement Heigham, a rather more sober one to his wife who predeceased him, and one from a century earlier in the sanctuary to one of his forebears. There are some brasses, some of which are replicas of ones now in the British Museum. The benches are mostly modern, except for a couple of very rustic ones in the south aisle and some bench ends up in the chancel. Father Peter MacLeod-Miller wants to clear the modern ones and replace them with chairs, so that he can have processions. I am sure they will prove very popular. Barrow was the parish where the last wolf in England was killed. How do I know this? Father Peter MacLeod-Miller told me so. So, what is the magic ingredient that is causing this parish to thrive against all apparent odds? I think it is Father Peter MacLeod-Miller himself. He strides energetically about his church, waving his arms. His long flowing hair is tied back with a large black ribbon. His flamboyance reminds me very much of the actor Graham Norton. I don't dare tell him so, of course. Let's finish with something else unusual. Father Peter MacLeod-Miller is lucky enough to have a sibling at the Royal Opera House. Because of this, he has a number of stars on tap for fund-raising events. A recent musical evening at the Rectory, Opera to Broadway, included the percussionist Evelyn Glennie. But, because the Rectory isn't very big, they hold the events out of doors, and he keeps his piano on the lawn. I doubt very much that anyone at Diocesan House reads my site (other than the lawyers, of course) but a memo to them just in case they do; I think you've found a winning formula. Let's have a Father Peter MacLeod-Miller in every moribund rural Anglican parish! 2011 postscript: Since I originally wrote this in 2003, Father Peter MacLeod-Miller has moved on to pastures new. Barrow church still seems to be very well-kept and much-loved, and this time I found it open.